Slash and his longtime wife, Perla Hudson, are splitting up after 13 years of marriage. According to TMZ, the former Guns N’ Roses guitarist filed for divorce citing “irreconcilable differences” and is asking for joint custody of their two sons: 12-year-old London and 10-year-old Cash. He lists June 15, 2014 as the date of their separation. This isn’t he first time things have been rocky between the couple. 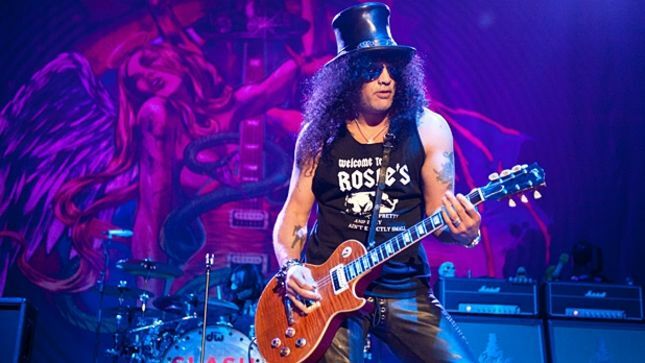 In 2010, Slash (whose real name is Saul Hudson) filed for divorce from Perla, but decided to give their marriage another shot two months later. The following year they renewed their wedding vows. Slash, meanwhile, is busy in his professional life. He will receive the Les Paul Award during the 30th annual NAMM Technical Excellence & Creativity Awards on Saturday, January 24th in Anaheim, California. Previous recipients include Todd Rundgren, Peter Gabriel and Neil Young. Slash has been performing as Slash Featuring Myles Kennedy and the Conspirators. Last September the band released the album, World On Fire.